The Navaho intercontinental cruise missile project was begun just after World War II, at a time when the US Army Air Force considered ballistic missiles to be technically impractical. The Navaho required a large liquid propellant rocket engine to get its Mach 3 ramjet up to ignition speed. This engine, derived with German assistance from that of the V-2, provided the basis for the rockets that would later take Americans into space. AKA: B-64;B-64A;SM-64;SM-64A;SSM-A-2;SSM-A-4;SSM-A-6. Status: Retired 1959. Completely unknown at the time was that the Soviet Union was developing two equivalent missiles, the Buran and the Burya. These were started later than the Navaho, but the Burya began flight test at about the same time. Like the Navaho, the Burya was canceled in favor of the intercontinental ballistic missile. Unlike the Navaho, it went on to a somewhat more successful flight test career. In August 1945 the US Army Air Force defined requirements for post-war missile development in a classified document. On Halloween 1945, they invited 17 aircraft systems manufacturers to submit proposals for design studies of specific weapons. North American Aviation chief Dutch Kindelberger, facing a reduction in employment from 100,000 to 6,500 employees as wartime aircraft production orders were canceled, determined that missiles were the future and decided to make the necessary investments to win one of the contracts. He founded a corporate research lab, staffed with experts in such new fields as jet propulsion, rockets, gyros, electronics, and automatic control. William Bollay, the branch chief for development of turbojet engines in the Navy's Bureau of Aeronautics, was identified as an appropriate leader of the lab. He arrived just in time to deal with the AAF request for proposals. 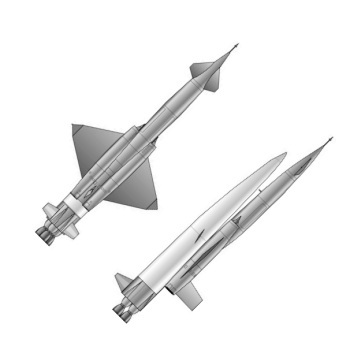 Bollay decided to propose American development of the A4b or A9, a winged, boost-glide version of the German V-2, against the Army Air Force mid-range supersonic missile requirement. On 24 March 1946 NAA received letter contract W33-038-ac-1491 for this missile, designated MX-770, with a range of up to 800 km. The payload requirement was increased from the 900 kg of the A9 to 1360 kg three months later. North American began its rocket research in the company parking lot, using a bulldozer scraper to protect adjacent parked cars from the inevitable exploding engines. They experimented first with a surplus Aerojet 4.5 kN motor. They then tried some small engines of their own devising, with up to 1.3 kN thrust. But as material came in from occupied Germany, it was obvious that the starting point would have to be the more advanced German technology. So in June 1946 Bollay proposed that North American first refurbish and test a complete V-2 engine system, to be provided by the government. This "Mark I" engine would be followed by redesign of the engine to American engineering standards and materials, followed by fabrication and testing of the "Mark II" American version. 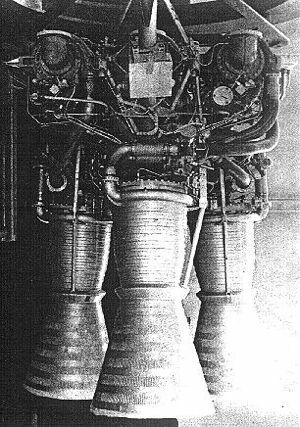 By the end of 1946, two government-furnished V-2 engines arrived. In March 1947 North American rented a large tract of land in the western San Fernando Valley north of Los Angeles, in the Santa Susana Mountains, for use in testing of large engines. A rocket test center was built here, using $1 million of corporate funds and $1.5 million from the Air Force. Meanwhile, North American had settled on a research and development program, based on additional information received on German breakthroughs in supersonic ramjets. Phase 1 consisted of a study of the German A4b and A9 boost-glide missiles; Phase 2 consisted of study of replacing the rocket engines of the design with supersonic ramjets in order to extend the range; Phase 3 would determine the size and type of the booster needed to boost the reengined A9 to ramjet ignition speed. By the end of the year Bollay had a staff of 43 working at his Technical Research Laboratory in Los Angeles, including 12 PhD's and 18 ME's. As North American engineers tore down and reassembled the V-2 engines, it was clear that this Model 39 18-chamber engine was an engineering kludge, a prototype that was rushed into production because the ultimate planned engine was unavailable. By the end of the war the Germans had been testing a more advanced Model 39a single-chamber engine. So in the spring of 1947, it was decided to proceed immediately to design, construction and test of a new engine, the NA-704 Mark III, based on the German Model 39a. To assist in this, Bollay's team was free to draw on the expertise of the V-2 designers themselves, now working for the US Army - Wernher von Braun's team, including Walther Riedel, Hans Huter, Rudi Beichel, and Konrad Dannenberg. Dannenberg in particular had been intimately involved with the 'shower head' injector plate that was essential for the single-chamber motor. Dieter Huzel, a close associate of von Braun, was hired by North American as a full-time employee in order to better coordinate work with the German team. In September 1947, preliminary design of the Mark III began, aiming at the thrust of the V-2 engine but with a weight reduction of 15 percent. In other technical areas, Bollay's engineers invented a Kinetic Double-Integrating Accelerometer (KDIA) design that allowed an inertial platform to also measure distance traveled. This breakthrough would allow long-distance unpiloted high-accuracy navigation. North American aerodynamicists discovered that the A9 swept-wing design was unstable at transonic speeds. The company selected an aft-wing with forward canard layout for the MX-770. 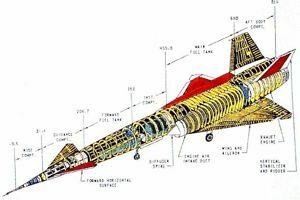 So by June 1947 the navigation concept, the propulsion, and the aerodynamic layout of the missile had all been fundamentally altered from the A9 baseline. North American had spent $3.9 million on the project. Development of specific components - the N-1 navigation system, the Mark III engine - was initiated. Construction of the launch site for the Nativ test vehicle was begun at Holloman AFB in New Mexico. In parallel with development of these new elements, construction of the Mark II copy of the 18-chamber V-2 engine continued, in order to obtain experience. Detailed design had begun in June 1947 with first drawing release and parts fabrication coming in September. Meanwhile test in the parking lot continued of a 14.7 kN test engine on which a variety of shower-head injector patterns could be tested. Meanwhile the XSSM-A-2 was redefined by the customer as only the first step of a revised three-phase program for a family of vehicles using a rocket booster and ramjet cruise. Track, air, and vertical pad launch were to be studied. The first phase would produce a missile with a range of 1600 km while carrying a 1350 kg warhead (the XSSM-A-2). Phase two would produce a missile that could carry a 1350 kg warhead to a 3200 to 4800 km range. Phase 3 would be the intercontinental version, carrying a 4500 kg nuclear warhead to an 8000 km range. In order to obtain the necessary accuracy, North American began development of the XN-2 navigation platform, which coupled the XN-1 inertial system with a star tracker to ensure continued accuracy even in long-range flights. 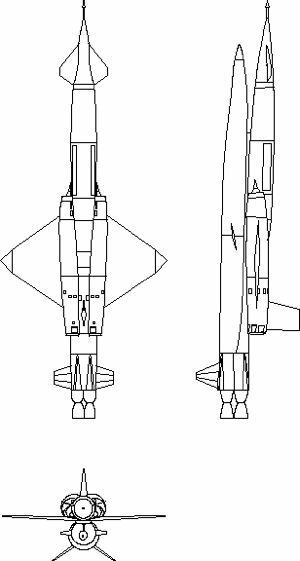 In order to achieve the longer ranges, North American began study of a version of the missile, which would use a separate, jettisonable rocket booster. This would allow the cruise stage to be ignited at near-cruise velocity, and to be filled with only ramjet fuel, which would vastly extend the range while the basic cruise missile remained nearly the same size. On 26 May 1948 North American made the first launch attempt of the Nativ subscale technology demonstrator. Seven rockets were built in total. There is barely any information on what this rocket was like, and even very inconsistent information on the flight series. It is not even known what kind of rocket engine powered the vehicle (perhaps the 14.7 kN test engine used in the parking lot tests). One source speaks of six launches, another of four, and a third of three. It seems that there were six launch attempts, three of which never made it very far off the pad, two made it some distance aloft, and only one that was considered somewhat successful (reaching Mach 2.23 and an altitude of 18 km). In July 1948, together with the company's Electromechanical Division, Bollay's expanding group was moved into an ex-Consolidated Vultee factory in Downey, east of Los Angeles. It would be here that the Navaho, and later Hound Dog missile, the Apollo command module, and the Space Shuttle would be built. 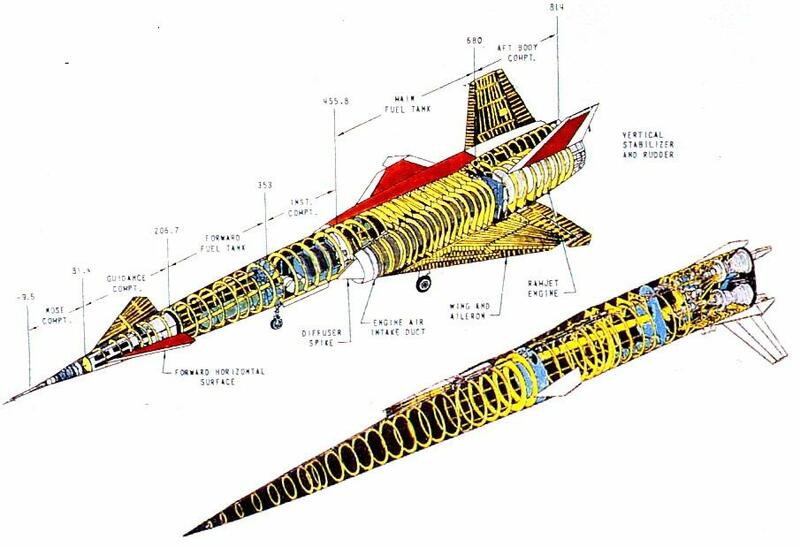 As a foreshadow of the future, the preferred intercontinental Navaho configuration of this time was a delta-winged, recoverable aircraft-type booster looking very much like the B-70 bomber of the 1960's or the reusable boosters of the original space shuttle designs. The cruise stage used a single enormous ramjet engine with a nose intake. Early in 1949, the first of three Phase II American-built versions of the Model 39 engine was completed. But by then North American was committed to the more advanced design, so this was continued only an interim test article. In May North American settled on a revised design for the intercontinental version of the Navaho. It consisted of a tandem in-line boost stage with a single-ramjet cruise stage atop it. In September, reacting to the surprise explosion by the Soviet Union of an atomic bomb, the Truman administration began pumping more funds into missile projects. In order to proceed to flight test on an accelerated schedule, the Navaho aerodynamic design was frozen so that fabrication of the XSSM-A-2 flight articles could begin. By late November of 1949, the first version of the Mark III engine was ready for testing at the new Santa Susana facility. Because it lacked turbopumps, propellants were pressure-fed from heavy-walled tanks. The North American team first ran the engine at 10 percent of maximum propellant flow for 11 seconds. However attempts for longer pressure-fed engine runs in December exhibited surges in combustion-chamber pressure (known as "hard starts") that were powerful enough to blow up the engine. Walther Riedel played an important role in introducing design modifications that brought this problem under control. In March 1950, this simplified engine first topped its rated level of 333 kN for four and a half seconds. During May and June, full-thrust runs, exceeding a minute in duration, went well. Meanwhile, Wright had completed design of the ramjets in December 1949 and begun fabrication. In April, with the first three XSSM-A-2 airframes completed, the Air Force canceled flight test of that 1600-km range version of the Navaho. North American was instructed instead to proceed with development of the 10,200-km range version of the missile using the same aerodynamics, engines, and navigation systems already in development. This was to deliver a 3150-kg nuclear payload - and that was to be achieved by making a separable booster stage with two engines deliver a ramjet-only cruise stage to ignition velocity. The configuration was revised to that of the final Navaho - a twin-ramjet cruise stage launched strapped to the side of a liquid-rocket booster. This arrangement minimized the length of the vehicle, making handling and erecting on the launch pad easier. Formal redirection of the program came in July 1950, just as the Korean War began. The missile, now designated WS-104A, was to deliver a 3150-kg warhead with a CEP of 450 m over a range of 10,200 km while cruising at Mach 3 at over 18 km altitude. The final missile would be developed in a three-phase program: Phase 1, using a reusable drone dubbed the X-10, would test the aerodynamics, structural concepts, autopilot, and inertial navigation system for the cruise missile using turbojet engines in an aluminum structure to achieve speeds of up to Mach 2. 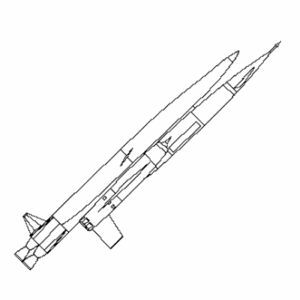 In Phase 2, the G-26 test vehicle would be a 2/3 scale version of the final version, testing the vertical launch booster, and a steel-structure ramjet-powered cruise vehicle that would reach Mach 2.75 and a range of 2300 km. Phase 3 would fly the G-38, the full-sized prototype for the operational system. The payload was sized to match the 20-kiloton W-4 nuclear warhead: 3150 kg in mass, 1.5 m in diameter and 2.3 m long. Meanwhile, development of the engine for the now-canceled XSSM-A-2 continued. Late in March 1950, the first complete engine, turbopumps included, was assembled. In August, this engine, designated XLR-43-NA-1 by the government, fired successfully for a full minute at 12.3 percent of rated thrust. Late in October, the first full-thrust firing reached 310 kN for less than five seconds. However now a new problem emerged - rough combustion during the build up to full thrust. As a result, of the seven subsequent tests during 1950, only one in mid-November reached the engine's rated thrust level. This combustion instability in the engine's single large thrust chamber had not been solved by the Germans before the end of the war, and they could not solve it now. However the North American engineers found a solution, and by March 1951 the problem of unstable combustion was under control. This marked an important milestone - the first time, the North American team had encountered and solved an important problem that the Germans could not solve. Combustion instabilities would recur repeatedly during subsequent engine programs, and the work of 1950 and 1951 provided North American engineers with several methods for work the problem. In just three years of development, the North American team had delivered an engine that weighed less than half as much as the V-2's model 39 (668 kg versus 1126 kg), while delivering 34 percent more thrust. They had formed the corporate technology base for further American development of rocket engines. North American's rocket division, later dubbed Rocketdyne, would go on to be the preeminent American liquid engine rocket builder, building the engines that would take the first American to orbit, the first man to the moon, and power the Space Shuttle. But this Mark III engine was now just a way-station to the more powerful 530 kN engine required for the new intercontinental Navaho. However, the Army had now directed von Braun's team to develop at utmost speed an 800-km range pure ballistic missile. With minor modifications, the Mark III would fit this requirement. So although the Mark III never went into production for the Air Force, its Army derivative boosted various versions of the Redstone tactical missile. And it would be this engine on the Redstone that would place the first American satellite in orbit and boost the first American into space. North American originally designed the X-10 to be reusable, air-dropped from a B-36, then automatically landed at an airfield. But the Air Force dropped support for air launching in August 1950 - a decision that would have consequences later. By December 1950 North American was completing model tests of the X-10 at its own Santa Susanna wind tunnel facility, taking it up to Mach 2.87. In June 1951 the Air Force inspected the X-10 full-sized mockup. The highly classified Mach-3 design, with cropped delta wing and canards, was far in advance of contemporary manned aircraft. The same month, the XLR-43-NA-1 engine was run for six seconds at 430 kN thrust, compared to its 333 kN rated thrust. Preliminary design of the new LR-71-NA-1 engine's lightweight tubular-construction 540 kN-thrust combustion chamber was begun. The brazed tubes would carry fuel to cool the chamber more evenly than the simpler double-walled German design of the XLR-43-NA-1. In September 1951 the X-10 detailed design drawings were released to the shop for fabrication. The course of 1952 saw a wide range of testing activities. 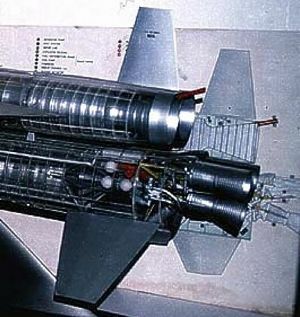 A 20-inch diameter ramjet, a subscale version of the 40-inch engine for the Navaho, was flown on Lockheed's X-7 rocket. Of the seven launches, only one was completely successful, and two partially successful. The G-26 version of Navaho reached the mock-up stage; and design of the G-38 was begun. In June a test version of the 540 kN combustion chamber for missile was run. This was the most powerful ever tested, but still used the double-walled combustion chamber design of the LR43 rather than the brazed tubular wall construction planned for the production LR71. But the first complete prototype was first operated on 19 November. By the end of the year the drawings for the G-26 were released to the shop, and the first X-10 had been completed and was in static testing. On 23 December the USAF released the full-scale development contract for the Navaho G-26, consisting of 10 cruise missiles, 13 boosters, and five N-6 stellar-inertial navigation systems (early flights would be radio-controlled). First delivery was scheduled for 1953 and first launch February 1956. But early in 1953 another technical improvement was deemed necessary, and this would impact the schedule just agreed. North American's rocket group had begun a Rocket Engine Advancement Program, to identify improved rocket technology. One early conclusion was that the performance and logistics could be significantly improved by shifting from alcohol to kerosene fuel. The decision was made to change the propellants for both the Navaho G-26 test vehicle and the G-38 production booster. The LR71 engine, improved and modified to burn kerosene, would be designated LR83. This meant a delay to Navaho, but would be the basic engine that would power the Thor, Jupiter, Atlas, Saturn I, and Delta rockets into the next century. The XN-2 navigation system for the Navaho had been flight tested aboard a C-97 aircraft between April 1952 and May 1953. A series of fifteen X-10 flights were conducted at Edwards Air Force Base from October 1953 to March 1955. A lot of time was wasted and four vehicles were lost in proving the autolanding capability for use at the skid strip at Cape Canaveral. In retrospect, an expendable vehicle might have completed the aerodynamic and guidance system test work more quickly. Meanwhile North American had also begun operations at Cape Canaveral in 1953, building two missile assembly buildings, a vertical launch facility for the XSM-64 (LC9) and a 70 m x 3000 m landing strip (the 'Skid Strip') to recover the reusable X-10 and G-26 test vehicles. North American tripled its field office staff at the Cape from 22 to 77 people in 1954. It also began installing equipment in the guidance laboratory, the blockhouse and the Navaho flight control building even before construction of those facilities was completed. Meanwhile the XN-2 navigation system was still found lacking for the production missile. The XN-6 introduced paired counterrotating gyroscopes to compensate for the precession errors resulting from the single-gyro-per-axis XN-2 design; and introduced hydrodynamic bearing gyros in place of the XN-2's air bearings. N-6 flight testing began aboard a T-29 in May 1954. On 11 January 1955 the Air Force expressed its confidence in the missile by placing the second G-26 second production contract. This added 12 more cruise stages, 21 boosters, and 6 N6 navigation systems, bringing the total procured to 22 cruise stages, 34 boosters, and 11 navigation systems. The first X-10 was launched from the Cape on 19 August 1955, and the Navaho quickly replaced the Matador as the range's principal user. Support facilities were completed in the last half of 1955, and seven more X-10s were launched from the Cape over the next twelve months. But North American management could see the ballistic missile competition gaining on them. The Thor, Jupiter, Atlas, and Titan development programs were all underway on a crash basis. But these missiles needed guidance systems and engines - and the Navaho's systems were far in advance of anything else available. On 7 November 1955 North American broke up the Navaho program into three new divisions. The Missile Development Division, in Downey, would handle the Navaho missile and its possible derivatives. The Autonetics Division would handle inertial navigation and other avionics products, and move from Downey to Anaheim. The Rocketdyne division would handle North American's liquid rocket motors, and move to a new facility in the western San Fernando Valley in Canoga Park, close to North American's rocket test facilities in the Santa Susanna mountains. These divisions were now free to market their products for use on other company's missiles. Rocketdyne liquid rocket engines were selected for the Thor, Jupiter, and Atlas missiles. The Titan was powered by Aerojet engines, purposely done by the Air Force in order to 'second source' the Atlas in case of some unforeseen catastrophic technical problem with the design. By the middle of 1956, North American had 605 people working on the Navaho program at the Cape. Five more X-10 flights were completed in the last half of 1956, but problems with an auxiliary power unit delayed the Navaho G-26's first launch for six months. When the first vehicle finally made it into the air, it exploded 26 seconds into the flight. Three more Navahos were launched over the next seven months with equally dismal results. In addition to those failures, the first in a series of 2,800 km long auto-navigator test flights was attempted ten times in the first three months of 1957 without a single launch. More promising were successful static tests of the booster rockets and North American's isolation of problem areas revealed in the first four flights. But while the "never-go-Navaho" sat on the pad or failed in flight, the first Jupiter, Thor, and Atlas ballistic missiles began test in the spring of 1957. They were equally unsuccessful at first, but a Jupiter made a full-range 2100-km flight on 31 May. The Army had already demonstrated the necessary re-entry vehicle technology on launches of the 'Jupiter-A' multi-stage versions of the Redstone. It was clear that these ballistic missiles, each little more complex than the booster stage of Navaho alone, could deliver a nuclear warhead over the same ranges - at seven times the speed. But it was still a surprise when Air Force Headquarters terminated the Navaho development program on 12 July 1957. 4,705 employees were laid off the day the termination notice was received via an announcement over the public address system to "stop what you are doing, proceed to the nearest exit, and deposit your badge in the bin indicated". By the end of the month the total staff laid off at North American alone amounted to 15,600 employees. At the time the program was canceled full-range G-38 missiles were in fabrication with first flight test planned by the end of 1958. On 21 August 1957, the Air Force handed North American a consolation prize - it was awarded a contract for the Hound Dog air-launched cruise missile. This was a crash project to equip B-52 bombers with supersonic nuclear missiles that could penetrate heavily-defended Soviet sites. The Hound Dog would use the aerodynamics of the G-38, and navigation and control systems developed for the Navaho, and an off-the-shelf turbojet engine. The program kept the core engineering and production staff together at North American's Downey facility - and this would be the team that won the Apollo contract, and later the Space Shuttle. Because the auto-navigator showed promise for use on other missiles, the Air Force authorized continuation of flight test of existing assets. Engineering staff was kept on at Cape Canaveral to launch the five completed G-26 missiles, at a total cost of $4.9 million. These were flown through February 1958, and were somewhat more successful than the earlier series, with one missile managing to reach a range of 2000 km before its ramjets failed. Seven further completed G-26 Navahos were to be tested in support the of North American's B-70 bomber and F-108 long-range interceptor programs. But after two unsuccessful launches in late 1958 that project was completely canceled at the insistence of the B-70 Weapons System Project Office. North American also attempted to revive the Navaho program with the Air Force. Test vehicle and reconnaissance versions were pitched. After Sputnik was launched, the company proposed the use of G-26 or G-38 boosters to launch a modified manned X-15 into space. None of these ideas were considered favorably by the customer. As North American closed out the Navaho program, three X-10s were selected as target drones for Bomarc antiaircraft missile tests. Two X-10's launched successfully on 24 September and 13 November 1958, but both burned at the end of their missions after running off the end of the Skid Strip. The last X-10 was launched on 26 January 1959, but self-destructed and crashed approximately 105 km downrange after a power failure. It was the Navaho project's final flight. 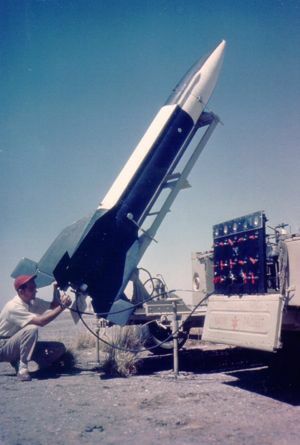 Navaho SSM-A-2 American intermediate range cruise missile. 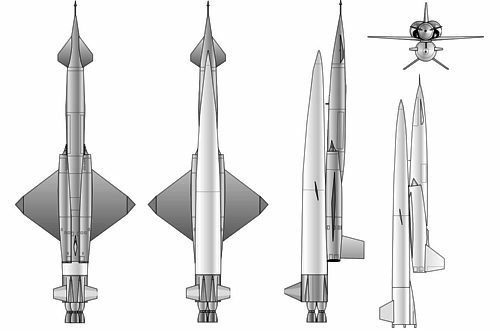 The first version of the Navaho developed in 1946-1950 was a Mach-3 ramjet vehicle with an integral rocket booster. Completion of the vehicle was cancelled in 1950 but the engine was used to power the Redstone ballistic missile. NATIV As part of its effort to develop what started out as an American version of the A9 boost-glide rocket, North American Aviation built seven Nativ subscale technology demonstrators. Navaho X-10 American intermediate range cruise missile. Reusable, conventional airfield takeoff-and-landing aerodynamic test vehicle for Navaho missile. Navaho G-26 American intermediate range cruise missile. The Navaho G-26 was a 2/3 scale test version of the operational Navaho G-38. The Navaho program was cancelled on 13 July 1957, but already-built G-26 test missiles were flown to the end of 1958. Hound Dog First American air-launched cruise missile to become operational. Based on Navaho technology. Navaho/X-15 North American proposed several methods of taking the X-15 spaceplane to higher velocities and altitudes. 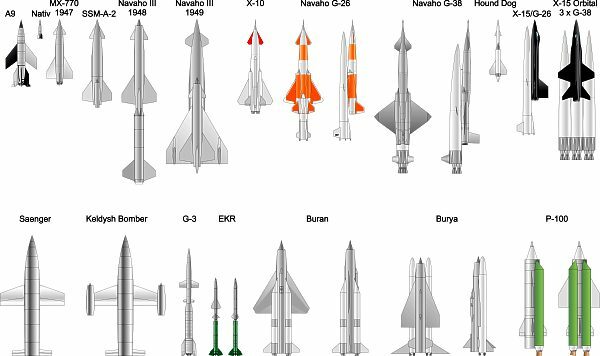 One of these involved the use of one to three Navaho booster rockets, which could even place the X-15 into orbit. 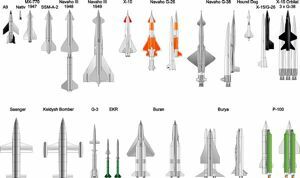 This incremental approach to manned spaceflight was not pursued - the Mercury and X-20 Dynasoar programs were favored instead. AGM-28A American intermediate range cruise missile. AGM-28B American intermediate range cruise missile. Family: ICCM, Spaceplane, US Cruise Missiles. Country: USA. Launch Sites: Edwards, Cape Canaveral, Grand Turk Island DZ. Agency: North American. Bibliography: 17, 2, 221, 278, 281, 44, 4472, 48, 563, 872. 1945 October 31 - . Launch Vehicle: Rascal. US Strategic Missile Programs Begin - . Nation: USA. Program: Navaho. Request For Proposals were issued to 17 contractors by the US Army Air Force for studies of a 10-year R&D program of four missile types. The missiles were to be air-, rail-, road-, or ship- transportable, and fit in three range categories: 280 to 800 km; 800 to 2400 km; and 2400 to 8000 km. Minimum speed was 970 kph, requiring turbojet, ramjet, or rocket propulsion. March to April 1946 - . Launch Vehicle: Rascal. Army Air Force awards nine one-year missile study contracts. - . Nation: USA. Program: Navaho. The MX-770 contract for an 800-km range boost-glide missile derived from the German A9 concept went to North American; this would evolve into the Navaho triple-sonic intercontinental cruise missile. Martin received a contract for development of the MX-771, a subsonic ground-launched cruise missile with an 800-km range; it would evolve into the Matador and Mace missiles. Curtiss-Wright and Republic received contracts for the MX-772 and MX-773 surface-to-surface missiles; they never advanced beyond the initial study stage. Convair received the contract for long-range rocket-powered missiles; this evolved into the Atlas ICBM. Northrtop received the MX-775 contract for a 5000-km range cruise missile; this eventually flew as the Snark. Bell receives a contract to develop the MX-776, a 160-km range rocket-powered supersonic missile to be launched from B-29 bombers. This would evolve into the Rascal. McDonnell received a study contract for the MX-777 air-to-surface missile; this evolved into the anti-submarine 'hydrobomb' concept and was eventually transferred to the Navy. Goodyear received contracts for the MX-778 and MX-779 air-to-surface missiles; these never advanced beyond the preliminary study stage. Concurrently, the USAAF had the GARPA surface-to-air missile project underway, which would evolve into Bomarc; the USA Army the Corporal and Hermes (later Redstone) surface-to-surface missiles and the Nike and Hermes A1 surface-to-air missiles; and the Navy a range of missile technology development projects (Regulus, Bat, Kingfisher, Little Joe, Lark, Bumblebee, Gorgon, Dove). 1946 March 24 - . Launch Vehicle: Navaho. MX-770 strategic missile study contract awarded - . Nation: USA. Program: Navaho. North American received W33-038-ac-1491, a $500,000 letter contract, for study of the MX-770, an 800 km range, supersonic guided missile with a 900 kg nuclear warhead..
1946 July 26 - . Launch Vehicle: Navaho. MX-770 fixed price contract finalized. - . Nation: USA. Program: Navaho. The payload requirement was increased to 1360 kg. North American was also to be provided with captured V-1 or American-built JB-1 Loon cruise missiles, Wasserfall or American Hermes C-2 missiles, and captured V-2 missiles. The company was also to produce as part of its development program an Americanised subscale V-2, the Nativ. 1946 November 29 - . Launch Vehicle: Keldysh Bomber. Keldysh Space Bomber authorised - . Nation: Russia. Related Persons: Keldysh, Saenger. Program: Navaho. The NII-1 NKAP research institute was formed with Mstislav Vsevolodovich Keldysh as its head to investigate and develop the German Saenger-Bredt design. It was clear from the preliminary study that an immense amount of work needed to be done before a draft project of a feasible design could be prepared - it would take until the mid-1950's. 1947 June - . Launch Vehicle: Navaho. MX-770 Phase 2 - . Nation: USA. Program: Navaho. Component development for the MX-770 missile begins. North American had spent $3.9 million to date on the project. Construction of the launch site for the Nativ test vehicle is begun at Holloman AFB in New Mexico..
1947 July - . Launch Vehicle: Navaho. MX-770 redirection - . Nation: USA. Program: Navaho. The concentration on fhe 800-km range missile was to be abandoned. Prototype missiles were now to be produced in three phases. Phase I would produce a missile with a range of 280 to 800 km; Phase II, one of 800 to 2400 km; and Phase III one of 2400 to 8000 km. 1947 September 15 - . US Army Air Corps assigned control of surface-to-surface strategic missiles - . Nation: USA. Program: Navaho. 1947 September 18 - . U.S. Army Air Corps becomes U.S. Air Force - . Nation: USA. Program: Navaho. The Air Force was now a separate service from the US Army. The agreement was made that the Air Force would only handle missiles with ranges over 1600 km. So the range requirement for the MX-770 (later the Navaho) was increased to 1600 km, while carrying a 1350-kg payload with an 800 m CEP, and it became an Air Force missile. 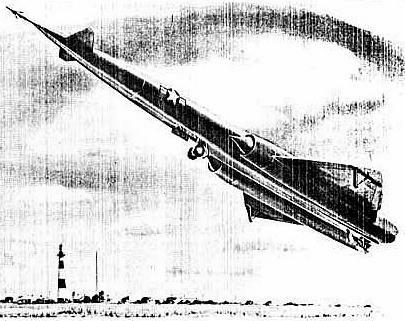 The 800-km MX-771 (later Matador) became an Army missile. The MX-775 Snark already had an intercontinental range requirement, and became an Air Force missile. 1948 February 25 - . Launch Vehicle: Navaho. USAF wishes to concentrate on longer-range Navaho. - . Nation: USA. Program: Navaho. The Navaho was redefined by the customer in a revised three-phase program using a rocket booster and ramjet cruise. Track, air, and vertical pad launch were to be studied. The first phase would produce a missile with a range of 1600 km while carrying a 1350 kg warhead. Phase two would produce a missile that could carry a 1350 kg warhead to a 3200 to 4800 km range. Phase 3 would be the intercontinental version, carrying a 4500 kg nuclear warhead to an 8000 km range. 1948 May 26 - . Launch Site: Holloman. Launch Complex: Holloman NATIV. LV Family: Navaho. Launch Vehicle: NATIV. FAILURE: Failure. Nativ first attempted launch - . Nation: USA. Agency: USAF. Apogee: 1.00 km (0.60 mi). First launch attempt of MX-770 technology demonstrator. Seven rockets were built in total. There is very inconsistent information on the flight series. One source speaks of six launches, another of four, and a third of three. It seems that there were six launch attempts, three of which never made it very far off the pad, two made it some distance aloft, and only one was considered somewhat successful (reaching Mach 2.23 and an altitude of 18 km). 1948 June - . Launch Vehicle: Navaho. Advanced Navaho concept - . Nation: USA. Program: Navaho. North American began study of an advanced version of the Navaho, which would use a separate, jettisonable rocket booster. This would allow the cruise stage to be ignited at near-cruise velocity, and to be filled with only ramjet fuel, which would vastly extend the range. In this same month design of the XN-1 inertial navigator is completed. 1948 July - . Launch Vehicle: Navaho. North American Aerophysics Laboratory moved to Downey. - . Nation: USA. Program: Navaho. Together with the company's Electromechanical Division, the expanding group was moved into an ex-Consolidated Vultee bomber factory east of Los Angeles. It was here that the Navaho, and later Hound Dog missiles, the Apollo command module, and the Space Shuttle would be built. 1948 Q3? - . Launch Site: Holloman. Launch Complex: Holloman NATIV. LV Family: Navaho. Launch Vehicle: NATIV. Nation: USA. Agency: USAF. Apogee: 15 km (9 mi). Spaatz calls for American ICBM. - . Nation: USA. Program: Navaho. General Spaatz (Tooey Spaatz) calls for US development of missile with 10,200 km range. 1948 October 15 - . Launch Site: Holloman. Launch Complex: Holloman NATIV. LV Family: Navaho. Launch Vehicle: NATIV. Nativ Launch - . Nation: USA. Agency: USAF. Apogee: 15 km (9 mi). On the most successful Nativ launch, the missile reached Mach 2.23 and an altitude of 18 km..
1948 November 1 - . Launch Site: Holloman. Launch Complex: Holloman NATIV. LV Family: Navaho. Launch Vehicle: NATIV. FAILURE: Failure. Final Nativ launch - . Nation: USA. Agency: USAF. Apogee: 0 km (0 mi). 1949 May - . LV Family: Navaho. Launch Vehicle: Navaho G-38. Intercontinental Navaho - . Nation: USA. Program: Navaho. North American settled on a design for the intercontinental version of the Navaho. It consisted of a tandem in-line boost stage with a single-ramjet cruise stage atop it..
1949 September - . Launch Vehicle: Rascal. Cold War intensifies - US missile programs given higher priority - . Nation: USA. Program: Navaho. Reacting to Russia's explosion of an atomic bomb, and the Communist victory in China's civil war, the US military begins increasing funding to the low-priority missile development programs begun in 1946. The Martin MX-771 tactical cruise missile is reinstated; additional funds are plowed into the Rascal and Snark programs; and the Corporal tactical missile is modified to carry a nuclear warhead. The Navaho aerodynamic design is frozen so that fabrication of the XSSM-A-2 flight articles can begin. 1949 October - . LV Family: Groettrup. Launch Vehicle: G-3. Albring G-3 cruise missile - . Nation: Russia. Related Persons: Albring, Groettrup, Saenger, Ustinov. Program: Navaho. German aerodynamicist Albring designed the G-3 missile for the Russians. This would use a rocket-powered Groettrup-designed G-1 as the first stage. The cruise stage would have an aerodynamic layout like that of the Saenger-Bredt rocket-powered antipodal bomber of World War II. Cruising at 13 km altitude, the supersonic missile would carry a 3000 kg warhead to a range of 2900 km. This was an alternate approach to Ustinov's 3000 kg over 3000 km range missile requirement of April 1949. This design would be elaborated at Korolev's bureau into the EKR ramjet design of 1953. 1949 December 7 - . Launch Vehicle: R-3. Groettrup G-4 IRBM evaluated against Korolev's R-3. R-3 project reformulated - . Nation: Russia. Related Persons: Korolev. Program: Navaho. The NTS (Scientific-Technical Soviet) of NII-88 met in plenary session and subjected Korolev's proposal to withering criticism. The G-4 was found to be superior. After heated discussion, the Soviet approved further development of technology for the R-3, but not the missile itself. The decisions were: an R-3A technology demonstrator would be built and flown under Project N-1 (probably to prove G-4 concepts). Under Project N-2 both the RD-110 and D-2 engines would proceed into development test in order to prove Lox/Kerosene propellant technology. Packet rocket and lightweight structure research for use in an ICBM would continue under project N-3 / T-1. Winged intercontinental cruise missile studies would continue under project N-3 / T-2. Neither the G-4 or R-3 ended up in production, but the design concepts of the G-4 led directly to Korolev's R-7 ICBM (essentially a cluster of G-4's or R-3A's) and the N1 superbooster. Work on the G-4 continued through 1952. 1950 January 1 - . Launch Vehicle: MKR. Design of 8,000 km range winged missile begun - . Nation: Russia. Related Persons: Korolev. Program: Navaho. Class: Manned. 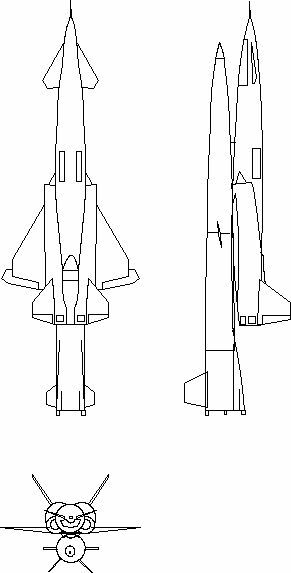 Type: Manned spaceplane. 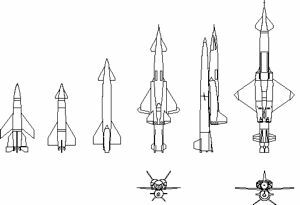 In parallel with the R-5 Korolev OKB NII-88 begins design of 8,000 km range winged missile..
1950 April - . Launch Vehicle: Navaho. Navaho reoriented - . Nation: USA. Program: Navaho. The XSSM-A-2 1600-km range version of the Navaho is canceled. The three airframes completed are abandoned. The USAF instructs North American to proceed instead with development of a 10,200-km range version of the missile using the same aerodynamics, engines, and navigation systems already in development. This is to deliver a 3150-kg nuclear payload, and is to be achieved by making a separable booster stage with two engines deliver a ramjet-only cruise stage to ignition velocity. 1950 May - . LV Family: Navaho. Launch Vehicle: Navaho X-10. Preliminary design of X-10 begins - . Nation: USA. Program: Navaho. Although the formal redirection of the Navaho program would not come for two months, North American began design of an aerodynamic and systems testbed..
1950 July - . Launch Vehicle: Navaho. Navaho specification finalized. - . Nation: USA. Program: Navaho. The missile, now designated WS-104A by the USAF, was to deliver a 3150-kg warhead with a CEP of 450 m over a range of 10,200 km while cruising at Mach 3 at over 18 km altitude. The final missile would be developed in a three-phase program: Phase 1, using the reusable X-10 drone, would test the aerodynamics, structural concepts, autopilot, and inertial navigation system for the cruise missile using turbojet engines in an aluminum structure to achieve speeds of up to Mach 2. 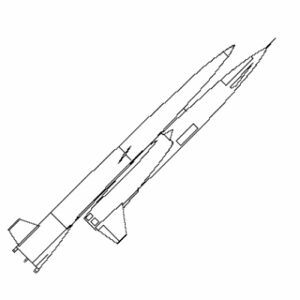 In Phase 2, the G-26 test vehicle would be a 2/3 scale version of the final version, testing the vertical launch booster, and a steel-structure ramjet-powered cruise vehicle that would reach Mach 2.75 and a range of 2300 km. Phase 3 would fly the G-38, the full-sized prototype for the operational system. The payload was sized to match the 20-kiloton W-4 nuclear warhead, 3150 kg in mass, 1.5 m in diameter and 2.3 m long. 1950 August - . LV Family: Navaho. Launch Vehicle: Navaho G-26. Air-launched Navaho dropped - . Nation: USA. Program: Navaho. All work on the air-launched versions of Navaho was stopped. North American was to concentrate on rocket-boosted missiles..
1950 October - . LV Family: Navaho. Launch Vehicle: Navaho G-26. Wright gets G-26 ramjet contract - . Nation: USA. Program: Navaho. The engine was designated XRJ47-W-1..
1950 December - . LV Family: Navaho. Launch Vehicle: Navaho X-10. Wind tunnel tests of X-10 model - . Nation: USA. Program: Navaho. North American conducted the tests at its own Santa Susanna facility, taking it up to Mach 2.87..
1950 December 4 - . Launch Vehicle: Buran M, Burya La-350. Research into intercontinental missile approaches authorised. - . Nation: Russia. Program: Navaho. Council of Soviet Ministers (SM) Decree 'On themes N1, N2, and N3 in the ballistic missile program.' was issued..
1951 March 24 - . LV Family: Buran M.
Central Committee decree created the OKB-23 Myasishchev design bureau. - . Nation: Russia. Related Persons: Myasishchev. Program: Navaho. Myasishchev was tasked with building an intercontinental jet-powered bomber, something veteran aircraft designer Tupolev said was impossible. Myasishchev managed to complete the first prototype 103M (called M-4 Bear in the West) bomber ten months after go-ahead. Myasishchev would later play a key role in Soviet spaceplane development. 1951 June - . Launch Vehicle: Navaho. LR43 run at 430 kN thrust - . Nation: USA. Program: Navaho. In preparation for development of the 540 kN LR71, the LR43 engine is run for six seconds at 430 kN thrust, compared to its 333 kN rated thrust. Preliminary design of the LR71's new lightweight tubular combustion chamber was begun. These brazed tubes would carry fuel to cool the chamber more evenly than the simpler double-walled German design of the LR43. 1951 June - . LV Family: Navaho. Launch Vehicle: Navaho X-10. USAF inspects X-10 mockup. - . Nation: USA. Program: Navaho. The highly classified Mach-3 design, with cropped delta wing and canards, was far in advance of contemporary manned aircraft..
1951 September - . LV Family: Navaho. Launch Vehicle: Navaho X-10. X-10 detailed design drawings released to the shop - . Nation: USA. Program: Navaho. 1951 December - . LV Family: Navaho. Launch Vehicle: Navaho G-38. Navaho warhead changed - . Nation: USA. Program: Navaho. The missile is to carry the 100-kt W-13 device instead of the 20-kt W-4..
1951 December - . LV Family: Navaho. Launch Vehicle: Navaho G-26. G-26 booster preliminary design review. - . Nation: USA. Program: Navaho. 1952 April - . Launch Vehicle: Navaho. X-7 tests prototype Navaho ramjet - . Nation: USA. Program: Navaho. A 20-inch diameter ramjet, a subscale version of the 40-inch engine for the Navaho, first flies on the X-7 rocket. Of the seven launches, only one was completely successful, and two partially successful..
1952 May - . LV Family: Navaho. Launch Vehicle: Navaho G-38. Preliminary design of the Navaho G-38 begins. - . Nation: USA. Program: Navaho. 1952 June - . LV Family: Navaho. Launch Vehicle: Navaho G-26. USAF inspects Navaho G-26 mockup - . Nation: USA. Program: Navaho. 1952 June - . Launch Vehicle: Navaho. First static firing of LR71 test engine - . Nation: USA. Program: Navaho. The 540 kN combustion chamber was the most powerful ever tested, but still used the double-walled combustion chamber design of the LR43 rather than the brazed tubular wall construction planned for the production LR71. Build of the first engine to this design would be completed in October. 1952 November 19 - . Launch Vehicle: Navaho. Navaho engine reaches 445 kN thrust. - . Nation: USA. Program: Navaho. At Santa Susana, Calif., a complete liquid-rocket engine assembly (Navaho) having a thrust in excess of 100,000 pounds (445 kN) was fired for the first time..
1952 December - . LV Family: Navaho. Launch Vehicle: Navaho X-10. First X-10 completed. - . Nation: USA. Program: Navaho. GM-19309, s/n 3, was the first completed at Downey. It was placed in a static test facility for five months of tests that verified the structural integrity..
1952 December - . LV Family: Navaho. Launch Vehicle: Navaho G-26. G-26 drawing release - . Nation: USA. Program: Navaho. The drawings were released to the shop and fabrication of component parts began..
1952 December 23 - . LV Family: Navaho. Launch Vehicle: Navaho G-26. Navaho G-26 contract - . Nation: USA. Program: Navaho. The USAF released the full-scale development contract for the Navaho G-26, consisting of 10 cruise missiles, 13 boosters, and five N-6 stellar-inertial navigation systems (early flights would be radio-controlled). First delivery was scheduled for 1953 and first launch February 1956. 1953 January - . Launch Vehicle: Navaho. REAP Program - . Nation: USA. Program: Navaho. North American's rocket group begins the Rocket Engine Advancement Program, to identify improved rocket technology. One early conclusion was that the performance and logistics could be significantly improved by shifting from alcohol to kerosene fuel, using a new specification RP-1. The decision is made to change the propellants for the Navaho G-38 production version booster. The LR71 engine, modified to burn kerosene, would be designated LR83. This in turn was the basic engine that would power the Thor, Jupiter, Atlas, Saturn I, and Delta rockets into the next century. 1953 April - . Launch Vehicle: Buran M, Burya La-350. USSR Council of Ministers approve R-7 ICBM, Buran and Burya intercontinental cruise missiles - . Nation: Russia. Related Persons: Korolev, Lavochkin, Myasishchev. Program: Navaho. Informal go-ahead was given for Korolev to start design work on the R-7. In parallel, Myasishchev OKB-23 and Lavochkin OKB-301 began design of intercontinental ramjet cruise missiles..
1953 May - . Launch Site: Edwards. LV Family: Navaho. Launch Vehicle: Navaho X-10. First X-10 delivered to Edwards AFB. - . Nation: USA. Program: Navaho. The crane dropped the aircraft at Edwards; but the damage could be repaired there. The autopilot and radio control systems had already been verified at Edwards in flights conducted with F-86D fighters and a QF-80 drone aircraft since December. An ET-33 flight control aircraft had been modified to control the X-10 in flight. 1953 August 28 - . Launch Vehicle: Navaho. Navaho engine reaches 890 kN thrust. - . Nation: USA. Program: Navaho. At Santa Susana, Calif., a complete liquid-rocket engine assembly (Navaho) having a thrust in excess of 200,000 pounds was fired for the first time..
1953 September 3 - . LV Family: Navaho. Launch Vehicle: Navaho X-10. First X-10 taxi test. - . Nation: USA. Program: Navaho. Three taxi tests were conducted through the end of September before the vehicle was considered ready for its first flight..
1953 October 14 - . Launch Site: Edwards. LV Family: Navaho. Launch Vehicle: Navaho X-10. Navaho X-10 flight 1 - . Nation: USA. Program: Navaho. Main landing gear doors failed to close; ground control of aircraft lost (ET-33 aircraft took over control of the X-10); main gear failed to lock on contact with runway; pilot drag chute deployed late; brake failure caused damage to two tires. But the drone was recovered. 1953 December 5 - . Launch Site: Edwards. LV Family: Navaho. Launch Vehicle: Navaho X-10. Navaho X-10 flight 2 - . Nation: USA. Program: Navaho. Landing gear again failed to retract. It was discovered the drag from the airflow exceeded the hydraulic retraction force over 320 kph..
1953 December 15 - . Launch Site: Edwards. LV Family: Navaho. Launch Vehicle: Navaho X-10. Navaho X-10 flight 3 - . Nation: USA. Program: Navaho. Planned transonic flight aborted when telemetry power failed..
1954 January - . LV Family: Navaho. Launch Vehicle: Navaho G-26. Navaho G-26 static tests begin - . Nation: USA. Program: Navaho. Vehicle 3 is placed in a static test fixture at Downey..
1954 January 22 - . LV Family: Navaho. Launch Vehicle: Navaho G-38. Navaho Weapon System Optimization Study - . Nation: USA. Program: Navaho. Various nuclear warheads were considered for the Navaho. The G-26 would only be capable of carrying the XW-12, XW-5, or XW-13 fission warheads, or the XW-15 thermonuclear device. North American proposed that the production Navaho be enlarged to carry a 4500 kg payload in a 148 inch x 70 inch diameter envelope. This would allow a high-yield thermonuclear device to be carried. 1954 March 1 - . LV Family: Atlas, Navaho. Launch Vehicle: Atlas A.
Atlas booster propulsion system work begins. - . Nation: USA. Work on MA-2 propulsion system for Atlas by Rocketdyne was begun, drawing upon the experience in developing the regeneratively cooled chamber developed for the Navaho..
1954 March 17 - . Launch Vehicle: Buran M, Burya La-350. Baikonur and Vladimirovka launch site plans. - . Nation: Russia. Program: Navaho. Council of Soviet Ministers (SM) Decree 'On selection of launch area for the R-7, 40 Buran, and 350 Burya' was issued..
1954 April - . Launch Vehicle: Navaho. Navaho navigation system change - . Nation: USA. Program: Navaho. The XN-1 inertial system had been replaced by the XN-2 stellar/inertial system in 1951. The XN-2 had been flight tested aboard a C-97 aircraft between April 1952 and May 1953. This is in turn was replaced by the XN-6. The XN-6 introduced paired counterrotating gyroscopes to compensate for the precession errors resulting from the single-gyro-per-axis XN-2 design; and introduced hydrodynamic bearing gyros in place of the XN-2's air bearings. N-6 flight testing began aboard a T-29 in May 1954. 1954 April 1 - . Launch Site: Edwards. LV Family: Navaho. Launch Vehicle: Navaho X-10. Navaho X-10 flight 4 - . Nation: USA. Program: Navaho. First supersonic flight; reached Mach 1.47..
1954 May - . Launch Vehicle: Navaho. First wind tunnel tests of a full-sized Navaho ramjet engine - . Nation: USA. Program: Navaho. 1954 May 4 - . Launch Site: Edwards. LV Family: Navaho. Launch Vehicle: Navaho X-10. Navaho X-10 flight 5 - . Nation: USA. Program: Navaho. Extended range test of radio control and telemetry in 72.5 minute flight. Supersonic flight not planned..
1954 June 4 - . Launch Site: Edwards. LV Family: Navaho. Launch Vehicle: Navaho X-10. Navaho X-10 flight 6 - . Nation: USA. Program: Navaho. Planned supersonic flight aborted. Left main tire blew on takeoff run. Flight achieved, but the gear could not be retracted. Ground loop on landing, the vehicle sustained repairable damage..
1954 July 1 - . Launch Site: Edwards. LV Family: Navaho. Launch Vehicle: Navaho X-10. Navaho X-10 flight 7 - . Nation: USA. Program: Navaho. Vehicle crashed and burned after 8 minutes of flight when a fire developed aboard..
1954 August 12 - . Launch Site: Edwards. LV Family: Navaho. Launch Vehicle: Navaho X-10. Navaho X-10 flight 8 - . Nation: USA. Program: Navaho. Structural test flight, extreme dive and then pull up at Mach 1.3..
1954 September 3 - . Launch Site: Edwards. LV Family: Navaho. Launch Vehicle: Navaho X-10. Navaho X-10 flight 9 - . Nation: USA. Program: Navaho. Test of automatic landing system. System failed and gear would not deploy. Radio-controlled belly landing made on lake bed. Vehicle was repairable..
1954 September 22 - . LV Family: Navaho. Launch Vehicle: Navaho G-38. Navaho G-38 modified - . Nation: USA. Program: Navaho. Acting on the North American recommendation of January, the Air Force drops the XW-13 warhead for the production Navaho and authorized production of a larger version to carry a 4500-kg warhead..
1954 September 28 - . Launch Site: Edwards. LV Family: Navaho. Launch Vehicle: Navaho X-10. Navaho X-10 flight 10 - . Nation: USA. Program: Navaho. Structural test flight. Successfully made extreme maneuvers at Mach 1.84. However automated landing system attempted to make landing flare 6 m below the runway level. Vehicle impacted at high speed and was destroyed. However the flight set a speed record for a turbojet-powered aircraft. 1954 November 18 - . Launch Vehicle: Navaho. Navaho inertial system tested. - . Nation: USA. Program: Navaho. Inertial guidance system for Navaho X-10 missile tested in first flight at Downey, California aboard North American's T-39 testbed..
1954 December - . Launch Vehicle: Navaho. Navaho G-26 booster static testing begins - . Nation: USA. Program: Navaho. 1954 December 1 - . Launch Site: Edwards. LV Family: Navaho. Launch Vehicle: Navaho X-10. Navaho X-10 flight 11 - . Nation: USA. Program: Navaho. First successful automated landing system flight..
1954 December 16 - . Launch Site: Edwards. LV Family: Navaho. Launch Vehicle: Navaho X-10. Navaho X-10 flight 12 - . Nation: USA. Program: Navaho. Second successful automated landing system flight..
1955 January 11 - . LV Family: Navaho. Launch Vehicle: Navaho G-26. Navaho G-26 second production contract - . Nation: USA. Program: Navaho. This added 12 more cruise stages, 21 boosters, and 6 N6 navigation systems, bringing the total procured to 22 cruise stages, 34 boosters, and 11 navigation systems..
1955 February 22 - . Launch Site: Edwards. LV Family: Navaho. Launch Vehicle: Navaho X-10. Navaho X-10 flight 13 - . Nation: USA. Program: Navaho. Supersonic flight aborted when afterburners failed. Automated landing failed. Chute deployed during radio controlled approach, causing the vehicle to auger into the desert and be destroyed..
1955 March - . LV Family: Navaho. Launch Vehicle: Navaho G-38. USAF inspects Navaho G-38 mockup. - . Nation: USA. Program: Navaho. 1955 March - . LV Family: Navaho. Launch Vehicle: Navaho G-26. Navaho G-26 static test article ruptures - . Nation: USA. Program: Navaho. During simulated propellant loading (with water) at Downey, a crack opened at one of the cruise stage mounting points. The water drained out of the tank, creating a vacuum, followed by implosion of the oxygen tank..
1955 March 11 - . Launch Site: Edwards. LV Family: Navaho. Launch Vehicle: Navaho X-10. Navaho X-10 flight 14 - . Nation: USA. Program: Navaho. First flight of refitted s/n 3, the static test article. Vehicle exploded on gear retraction - it was found that the destruct package was wired to the gear circuit instead of the engine circuit..
1955 March 24 - . Launch Site: Edwards. LV Family: Navaho. Launch Vehicle: Navaho X-10. Navaho X-10 flight 15 - . Nation: USA. Program: Navaho. Successful test of automated landing system, certifying the X-10 for operation from the Cape Canaveral skid strip..
1955 June - . LV Family: Navaho. Launch Vehicle: Navaho G-26. First pair of Navaho ramjets accepted by Air Force - . Nation: USA. Program: Navaho. 1955 August 19 - . Launch Site: Cape Canaveral. Launch Complex: Cape Canaveral RW30/12. LV Family: Navaho. Launch Vehicle: Navaho X-10. Navaho X-10 flight 16 - . Nation: USA. Agency: USAF. Program: Navaho. Demonstrated planned automated landing, but drag chute did not deploy after landing. The vehicle overran the skid strip, the nosewheel collapsed in the sand in the overrun, the tanks ruptured, and the vehicle burned..
1955 September - . Launch Vehicle: Burya La-350. Burya preliminary design completed - . Nation: Russia. Related Persons: Lavochkin. Program: Navaho. The Lavochkin team completed preliminary design of the intercontinental Mach 3 cruise missile..
1955 October 24 - . Launch Site: Cape Canaveral. Launch Complex: Cape Canaveral RW30/12. LV Family: Navaho. Launch Vehicle: Navaho X-10. Navaho X-10 flight 17 - . Nation: USA. Agency: USAF. Program: Navaho. An engine problem resulted in a mission abort. After autolanding the nose wheel developed a shimmy, the vehicle ran off the skid strip, caught fire, and was destroyed..
1955 November 7 - . Launch Vehicle: Navaho. North American reorganizes - . Nation: USA. Program: Navaho. With the growth of its missile products beyond the Navaho program, and emerging requirements for the Navaho's navigation and rocket engine systems on ballistic missiles, North American broke up the Navaho program into two new divisions. The Missile Development Division, in Downey, would handle the Navaho missile and Hound Dog air-launched cruise missile, a derivative of the X-10 Navaho test vehicle. The Autonetics Division, would handle inertial navigation and other avionics products, and move from Downey to Anaheim. The Rocketdyne division would handle North American's increasing line of liquid rocket motors, and move to a new facility in the western San Fernando Valley in Canoga Park, close to North American's rocket test facilities in the Santa Susanna mountains. 1956 During the Year - . Launch Vehicle: Buran M, Burya La-350. Lavochkin begins construction of first Burya cruise missile. - . Nation: Russia. Related Persons: Lavochkin, Myasishchev. Program: Navaho. Myasishchev was just completing project design of his Buran design, while Lavochkin was already completing construction of the first Burya..
1956 February 3 - . Launch Site: Cape Canaveral. Launch Complex: Cape Canaveral RW30/12. LV Family: Navaho. Launch Vehicle: Navaho X-10. Navaho X-10 flight 18 - . Nation: USA. Agency: USAF. Program: Navaho. The vehicle reached Mach 1.9 on a 51-minute long-range flight. It landed successfully..
1956 February 20 - . Launch Vehicle: Navaho. North American proposes Navaho acceleration - . Nation: USA. Program: Navaho. Facing being surpassed by the fast development of the Atlas ICBM, North American proposes Project Broomstick. This would accelerate Navaho G-26 inertial-navigation-equipped dive-in flights to October 1956. This would make the vehicle expendable, removing all the likely problems in developing a recoverable vehicle that was in any case not applicable to production. Deletion of the landing gear and parachutes would also allow greater range to be demonstrated. Altogether it was believed the change would allow G-38 full-scale vehicle flights to start in June 1958 and deployment of the operational Navaho in 1960. 1956 February 29 - . Launch Site: Cape Canaveral. Launch Complex: Cape Canaveral RW30/12. LV Family: Navaho. Launch Vehicle: Navaho X-10. Navaho X-10 flight 19 - . Nation: USA. Agency: USAF. Program: Navaho. The vehicle reached a record Mach 2.1 speed and autolanded safely on the skid strip after a 62 minute flight..
1956 March 20 - . Launch Site: Cape Canaveral. Launch Complex: Cape Canaveral RW30/12. LV Family: Navaho. Launch Vehicle: Navaho X-10. Navaho X-10 flight 20 - . Nation: USA. Agency: USAF. Program: Navaho. Test of high angle-of-attack approach and recovery system. Flawless autolanding on the skid strip with precision short landing (1080 m landing roll)..
1956 March 26 - . LV Family: Navaho. Launch Vehicle: Navaho G-26. First Navaho G-26 flight booster delivered to Cape Canaveral - . Nation: USA. Program: Navaho. 1956 April 7 - . LV Family: Navaho. Launch Vehicle: Navaho G-26. First Navaho G-26 flight cruise stage delivered to Cape Canaveral - . Nation: USA. Program: Navaho. However continued problems and late delivery of the Auxiliary Power Unit pushed the planned first launch date from May to July. Three APU's were shipped before one was accepted. Attempts for a pad static test of the boost engines began in August. Seven attempts were made through the end of September. 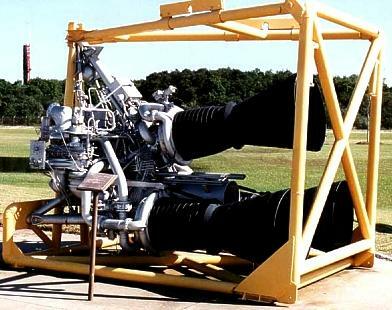 The fiberglass liquid oxygen tank insulation delaminated during the first propellant loading; chair springs were used to hold it on in subsequent tests. Helium lines ruptured; the engine was shut off after three seconds due to high gas generator temperatures; the G-26 cruise stage's landing gear deployed internally, cracking the skin; finally at the end of September a 34-second test was completed, but on ground power after the APU failed. The missile was pulled from the flight order and the first Broomstick flight canceled. 1956 April 24 - . Launch Site: Cape Canaveral. Launch Complex: Cape Canaveral RW30/12. LV Family: Navaho. Launch Vehicle: Navaho X-10. Navaho X-10 flight 21 - . Nation: USA. Agency: USAF. Program: Navaho. Ground control system failure resulted in missile crashing at sea at Mach 1.25 200 km from the Cape..
1956 June - . LV Family: Navaho. Launch Vehicle: Navaho G-38. G-38 booster engine test - . Nation: USA. Program: Navaho. The cluster of three engines produced 1800 kN for 45.5 seconds..
1956 June 5 - . Launch Site: Cape Canaveral. Launch Complex: Cape Canaveral RW30/12. LV Family: Navaho. Launch Vehicle: Navaho X-10. Navaho X-10 flight 22 - . Nation: USA. Agency: USAF. Program: Navaho. Inertial navigation test. Flight aborted when computer malfunction prevented INS signals from being passed to the autopilot. Successful autoland; drag brake deploy failure; successful engagement by runway landing barrier..
1956 July 18 - . Launch Site: Cape Canaveral. Launch Complex: Cape Canaveral RW30/12. LV Family: Navaho. Launch Vehicle: Navaho X-10. Navaho X-10 flight 23 - . Nation: USA. Agency: USAF. Program: Navaho. Inertial navigation system test. Flight aborted when computer system failed during takeoff. Successful recovery on skid strip..
1956 August 27 - . Launch Site: Cape Canaveral. Launch Complex: Cape Canaveral RW30/12. LV Family: Navaho. Launch Vehicle: Navaho X-10. Navaho X-10 flight 24 - . Nation: USA. Agency: USAF. Program: Navaho. Full-range test with final dive maneuver. Swan song of vehicle eight after three successful recovered missions. During takeoff the vehicle was aloft, then settled back to the runway with its brakes locked. The tires burst, the gear failed, the gear doors were in contact with the runway, carving grooves in the pavement as they retracted. Then, astonishingly, the vehicle rose from the runway, completed a successful full-range supersonic flight with terminal dive into the waters off Grand Bahamas. 1956 September - . Launch Vehicle: Burya La-350. Burya redesign - . Nation: Russia. Related Persons: Lavochkin. Program: Navaho. Lavochkin experienced a major setback in when the payload requirement for the nuclear warhead was increased from 2,100 to 2,350 kg..
1956 September 21 - . Launch Site: Cape Canaveral. Launch Complex: Cape Canaveral RW30/12. LV Family: Navaho. Launch Vehicle: Navaho X-10. Navaho X-10 flight 25 - . Nation: USA. Agency: USAF. Program: Navaho. N-6 inertial navigation test flight. Successful 79-minute flight, marred by pitot icing at one point. Successful recovery. Navigator error reached 3 miles at one point, but was one mile at the end of the mission..
1956 October 24 - . Launch Site: Cape Canaveral. Launch Complex: Cape Canaveral RW30/12. LV Family: Navaho. Launch Vehicle: Navaho X-10. Navaho X-10 flight 26 - . Nation: USA. Agency: USAF. Program: Navaho. Successful inertial navigation test flight..
1956 November 6 - . Launch Site: Cape Canaveral. Launch Complex: Cape Canaveral LC9. LV Family: Navaho. Launch Vehicle: Navaho G-26. FAILURE: Pitched up, disintegrated at T+26 seconds - pitch rate gyro installed backwards. Navaho G-26 Flight 1 - . Nation: USA. Agency: USAF. Apogee: 2.00 km (1.20 mi). Continuing problems with APU reliability delayed the launch to November. Various problems extended the countdown from the planned 7 hours 30 minutes to 14 hours 30 minutes. Successful launch, then vehicle pitched up and disintegrated 26 seconds after launch, impacting 4 km down range. It was found the pitch rate gyro had been installed backward. 1956 November 20 - . Launch Site: Cape Canaveral. Launch Complex: Cape Canaveral RW30/12. LV Family: Navaho. Launch Vehicle: Navaho X-10. Navaho X-10 flight 27 - . Nation: USA. Agency: USAF. Program: Navaho. Final X-10 flight. After cruise at Mach 1.3 at 75 km, the missile made a dive and precision impact on an island down-range..
1957 February - . LV Family: Navaho. Launch Vehicle: Navaho G-38. Navaho G-38 design released to production. - . Nation: USA. Program: Navaho. 1957 February 27 - . Launch Vehicle: Navaho. Navaho - the beginning of the end. - . Nation: USA. Program: Navaho. With the Navaho stuck on the pad, and the Atlas ICBM nearing first flight, the Air Force began cutting back funds to the Navaho. Advertising for construction of G-38 production missile support facilities at the Cape was pulled, and the program was rescheduled to accommodate a 32% funding cutback in 1958, with construction limited to 16 G-26 missiles and the first G-38 flight delayed from June 1958 to February 1959. 1957 March 1 - . LV Family: Navaho. Launch Vehicle: Navaho G-26. Navaho launch scrub - . Nation: USA. Program: Navaho. There were ten attempts to launch Navaho G-26 vehicle number 4 since the first static firing test on 3 December 1956 had been unsuccessful. The vehicle was plagued with problems with the engines and APU, resulting in engine burn-through, engine non-ignition, as well as other unrelated problems - ramjet engine fires, destruct package failures. The vehicle was pulsed from the launch order. 1957 March 22 - . Launch Site: Cape Canaveral. Launch Complex: Cape Canaveral LC9. LV Family: Navaho. Launch Vehicle: Navaho G-26. FAILURE: Ground pod failed to jettison; booster damaged and did not achieve speed/altitude required for cruise stage ignition.. Failed Stage: 1. Navaho G-26 Flight 2 - . Nation: USA. Agency: USAF. Apogee: 9.00 km (5.50 mi). G-26 number two / booster 6 lifted off after a 9 hour 48 minute countdown with nearly five hours of holds, on the first attempt after two successful static firings. However failure of a launch lanyard meant the kerosene start-pod on the booster remained attached. This sheared off at 4500 m, causing extensive booster damage. Thrust decayed. The cruise stage separated at Mach 1.3 at 28,300 feet, but this was below ramjet ignition speed. However the pilot on the ground was able to assume radio control of the vehicle, and flew it in a glide over the ocean, even demonstrating landing gear deployment before it pancaked into the water. 1957 April 25 - . Launch Site: Cape Canaveral. Launch Complex: Cape Canaveral LC9. LV Family: Navaho. Launch Vehicle: Navaho G-26. FAILURE: Booster shut down 1 m over the pad due to incorrect shutdown timer signal - exploded on pad.. Failed Stage: 1. Navaho G-26 Flight 3 - . Nation: USA. Agency: USAF. Apogee: 0 km (0 mi). Vehicle 4 was still not ready for the first Broomstick flight, so vehicle 5 was substituted. It took five attempts before a 15.6 second static test cleared the booster for launch on 29 March. 8 hours and 42 minutes of hold stretched the five-hour countdown out into the evening. The booster ignited, rose 1.3 m, then shut down. The vehicle fell back onto the pad, exploding. Cause was a 15-second timer that was supposed to shut the engines down 15 seconds after the vehicle hold-downs released if a lanyard had not been pulled free of the vehicle as it rose off the ground. The 15 seconds had been reached before the lanyard pulled free, but by then the vehicle had risen off the pad. This made 15 attempts to launch a Navaho, with only two booster ignitions, both resulting in loss of the vehicle. 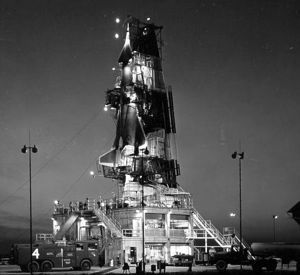 The Northrop crews at the Cape dubbed their competitor the "Never-Go Navaho" to counter jibes directed at them about the "Snark-infested waters" off the launch area. The Air Force was not amused, and had a tiger-team review of the G-26 on a system-basis which recommended several procedures. Meanwhile G-38 launch plans were further delayed over internal USAF wrangles over launch facility construction. 1957 June 26 - . Launch Site: Cape Canaveral. Launch Complex: Cape Canaveral LC9. LV Family: Navaho. Launch Vehicle: Navaho G-26. FAILURE: One booster engine failed during ascent; did not achieve speed/altitude required for cruise stage ignition.. Failed Stage: 1. Navaho G-26 Flight 4 - . Nation: USA. Agency: USAF. Apogee: 12 km (7 mi). 1957 July 13 - . Launch Vehicle: Navaho. USAF cancels the Navaho program. - . Nation: USA. Program: Navaho. 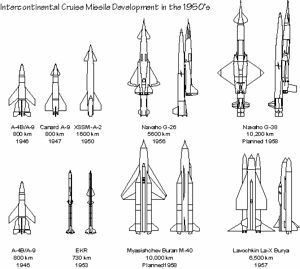 The supersonic intercontinental cruise missile had been made obsolete by the Atlas ICBM. 4,705 employees were laid off the day the termination notice was received via an announcement over the public address system to "stop what you are doing, proceed to the nearest exit, and deposit your badge in the bin indicated". By the end of the month the total laid off at North American alone amounted to 15 ,600 employees. However engineering staff was kept on to launch the five completed G-26 missiles, at a total cost of $4.9 million. At the time the program was cancelled full-range G-38 missiles were in fabrication with first flight test planned by the end of 1958. The engines, missile frame manufacturing techniques, inertial and stellar navigation equipment, and telemetry/guidance techniques developed for Navaho established the technical basis for many subsequent US rocket developments. 1957 August 12 - . Launch Site: Cape Canaveral. Launch Complex: Cape Canaveral LC10. LV Family: Navaho. Launch Vehicle: Navaho G-26. Navaho G-26 Flight 5 - . Nation: USA. Agency: USAF. Apogee: 25 km (15 mi). After a 15 hour 18 minute countdown G-26 number four finally left the pad. The boost phase was completed successfully; but then a guidance system malfunction prevented the cruise stage from separating from the booster until an altitude of 25 km was reached. However the autopilot successfully overcome drastic pitch oscillations created by the lofted trajectory, and the ramjets were successfully ignited. The stage cruised at Mach 2.93 for 280 km. However then the vehicle began drifting off course. The ground pilot banked, but the fuselage screened the airflow to the left ramjet intake, resulting in that engine flaming out. The vehicle lost speed and altitude, and the right engine flamed out a minute later. The missile was ordered into a terminal dive, impacting 425 km downrange. 1957 September 18 - . Launch Site: Cape Canaveral. Launch Complex: Cape Canaveral LC9. LV Family: Navaho. Launch Vehicle: Navaho G-26. Navaho G-26 Flight 6 - . Nation: USA. Agency: USAF. Apogee: 23 km (14 mi). The booster worked well, the cruise stage separated at 23.5 km altitude. The ramjets ignited, and the cruise stage accelerated to Mach 3.5. After 15 minutes, the missile began drifting off-course, and ground control took over and banked the missile. One of the ramjets flamed out, and the missile was commanded into a terminal dive and impacted 930 km downrange. 1957 November 13 - . 17:28 GMT - . Launch Site: Cape Canaveral. Launch Complex: Cape Canaveral LC9. LV Family: Navaho. 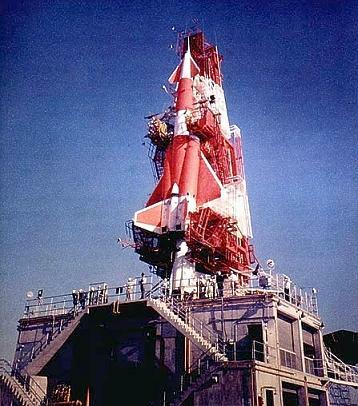 Launch Vehicle: Navaho G-26. FAILURE: Destroyed by range safety after telemetry dropped out at T+75 seconds. Navaho G-26 Flight 7 - . Nation: USA. Agency: USAF. Apogee: 20 km (12 mi). The booster functioned well, and the cruise stage separated at 20.4 km altitude and Mach 3.24. The ramjets ignited, but before the ground knew that, the telemetry dropped out completely due to a faulty voltage regulator on the missile. Range safety ordered the missile's self destruction at T+75 seconds. 1958 January 10 - . 19:38 GMT - . Launch Site: Cape Canaveral. Launch Complex: Cape Canaveral LC9. LV Family: Navaho. Launch Vehicle: Navaho G-26. Navaho G-26 Flight 8 - . Nation: USA. Agency: USAF. Apogee: 22 km (13 mi). The booster functioned well, the cruise stage separated at 22 km and Mach 3.15. The ramjets ignited and the cruise stage flew at a sustained speed of Mach 2.8 for forty minutes over a distance of 2000 km. Then the vehicle began a turn for the return to the Cape for recovery. However it seemed the turn was not fast enough; ground control took over, and yet again the right ramjet flamed out in a ground-piloted bank. The missile was commanded into a terminal dive at sea. 1958 February 11 - . LV Family: Thor, Atlas, Titan, Navaho. Launch Vehicle: Thor Able, Thor Agena A. 14 Thor boosters to be used during year for space and ICBM missions. - . Spacecraft: Man-In-Space-Soonest. 1958 February 26 - . 17:22 GMT - . Launch Site: Cape Canaveral. Launch Complex: Cape Canaveral LC9. LV Family: Navaho. Launch Vehicle: Navaho G-26. FAILURE: Booster shut down at T+20 seconds.. Failed Stage: 1. Navaho G-26 Flight 9 - . Nation: USA. Agency: USAF. Apogee: 2.00 km (1.20 mi). The booster shut down at T+20 seconds in the flight. The vehicle was self-destructed by range safety before separation of the cruise stage had occurred..
1958 March 24 - . Launch Vehicle: Burya La-350. Further development of Burya authorised. - . Nation: Russia. Program: Navaho. State Committee for Defence Technology (GKOT) Decree 'On the Creation of the Burya Winged Missile--course of work on 40 Burya' was issued..
1958 September 11 - . Launch Site: Cape Canaveral. Launch Complex: Cape Canaveral LC9. LV Family: Navaho. Launch Vehicle: Navaho G-26. FAILURE: Booster performed well, but cruise stage never ignited due to fuel system failure..
Navaho G-26 Flight 10 RISE-1 - . Nation: USA. Agency: USAF. Apogee: 25 km (15 mi). North American had received funding to fly seven surplus G-26 missiles in a program dubbed RISE (Research Into Supersonic Environment), ostensibly to obtain real-world data on Mach 3 flight for the F-108 interceptor and B-70 bomber that they were developing for the USAF. On this first attempt, the booster performed well, but after separation the cruise stage fuel system failed, and ramjet ignition never occurred. The cruise stage impacted 150 km downrange. 1958 September 24 - . Launch Site: Cape Canaveral. Launch Complex: Cape Canaveral RW30/12. LV Family: Navaho. Launch Vehicle: Navaho X-10. Navaho X-10 Drone BOMARC target mission 1 - . Nation: USA. Agency: USAF. Program: Navaho. The remaining X-10's were expended as targets for Bomarc and Nike antiaircraft missiles. The X-10 flew out over the ocean, then accelerated toward the Cape at supersonic speed. A Bomarc A missile came within lethal miss distance. The X-10 then autolanded on the Skid Strip, but both the drag chute and landing barrier failed. The vehicle ran off the runway and exploded. 1958 November 13 - . Launch Site: Cape Canaveral. Launch Complex: Cape Canaveral RW30/12. LV Family: Navaho. Launch Vehicle: Navaho X-10. Navaho X-10 Drone BOMARC target mission 2 - . Nation: USA. Agency: USAF. Program: Navaho. The X-10 flew out over the ocean, then accelerated toward the Cape. However the Bomarc A failed to launch. 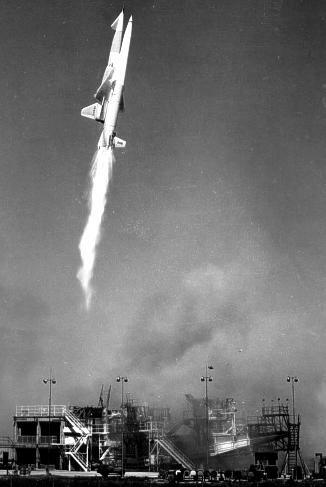 Autoland was successful, but again the drag chute and landing barrier both failed, and the vehicle burned after overrunning the runway..
1958 November 18 - . 21:03 GMT - . Launch Site: Cape Canaveral. Launch Complex: Cape Canaveral LC9. LV Family: Navaho. Launch Vehicle: Navaho G-26. FAILURE: Disintegrated at moment of booster shutdown.. Failed Stage: 1. Navaho G-26 Flight 11 RISE-2 - . Nation: USA. Agency: USAF. Apogee: 23 km (14 mi). The vehicle disintegrated at 23.5 km altitude at the time of booster shutdown and cruse stage separation. The USAF canceled further RISE flights and this definitively marked the end of the Navaho..
1959 January 26 - . Launch Site: Cape Canaveral. Launch Complex: Cape Canaveral RW30/12. LV Family: Navaho. Launch Vehicle: Navaho X-10. Navaho X-10 Drone BOMARC target mission 3 - . Nation: USA. Agency: USAF. Program: Navaho. The X-10 was launched with only one electrical generator due to a lack of any remaining spares. As it headed out over the ocean, that generator failed. It lost all electrical power, and crashed into the ocean 105 km downrange..
1959 February 20 - . Launch Site: Kapustin Yar. Launch Complex: Kapustin Yar VLAD. Launch Pad: Burya. Launch Vehicle: Burya La-350. Burya launch attempt - . Nation: Russia. Program: Navaho. Erroneous operation of the AVD abort system in one of the boosters prevented launch..
1959 April 23 - . Launch Site: Grand Turk Island. Launch Complex: Grand Turk Island DZ. Launch Platform: B-52. LV Family: Navaho. Launch Vehicle: Hound Dog. Test mission - . Nation: USA. Agency: USAF. Program: Navaho. Apogee: 20 km (12 mi). First Hound Dog test launch..
1959 June 9 - . Launch Site: Cape Canaveral. Launch Complex: Cape Canaveral AMR DZ. LV Family: Navaho. Launch Vehicle: Hound Dog. Test mission - . Nation: USA. Agency: USAF. Apogee: 20 km (12 mi). 1959 August 21 - . Launch Site: Cape Canaveral. Launch Complex: Cape Canaveral AMR DZ. LV Family: Navaho. Launch Vehicle: Hound Dog. 1959 October 30 - . Launch Site: Cape Canaveral. Launch Complex: Cape Canaveral AMR DZ. LV Family: Navaho. Launch Vehicle: Hound Dog. 1959 December 18 - . Launch Site: Cape Canaveral. Launch Complex: Cape Canaveral AMR DZ. LV Family: Navaho. Launch Vehicle: Hound Dog. 1959 December 23 - . Launch Site: Cape Canaveral. Launch Complex: Cape Canaveral AMR DZ. LV Family: Navaho. Launch Vehicle: Hound Dog. 1960 February 5 - . Launch Vehicle: Burya La-350. Burya cruise missile canceled. - . Nation: Russia. Program: Navaho. Decree 138-48 'On termination of work on the La-350 Burya at OKB-301' was issued. Project finally cancelled based on availability and invulnerability of R-7, R-9, and R-16 ICBM's. Flight test for technology purposes of already-built missiles was allowed to the end of the year. 1960 February 25 - . Launch Site: Cape Canaveral. Launch Complex: Cape Canaveral AMR DZ. LV Family: Navaho. Launch Vehicle: Hound Dog. 1960 February 29 - . Launch Site: Cape Canaveral. Launch Complex: Cape Canaveral AMR DZ. LV Family: Navaho. Launch Vehicle: Hound Dog. 1960 March 11 - . Launch Site: Cape Canaveral. Launch Complex: Cape Canaveral AMR DZ. LV Family: Navaho. Launch Vehicle: Hound Dog. 1960 March 24 - . Launch Site: Cape Canaveral. Launch Complex: Cape Canaveral AMR DZ. LV Family: Navaho. Launch Vehicle: Hound Dog. 1960 April 12 - . Launch Site: Cape Canaveral. Launch Complex: Cape Canaveral AMR DZ. LV Family: Navaho. Launch Vehicle: Hound Dog. 1960 April 18 - . Launch Site: Cape Canaveral. Launch Complex: Cape Canaveral AMR DZ. LV Family: Navaho. Launch Vehicle: Hound Dog. 1960 May 17 - . Launch Site: Cape Canaveral. Launch Complex: Cape Canaveral AMR DZ. LV Family: Navaho. Launch Vehicle: Hound Dog. 1960 May 24 - . Launch Site: Cape Canaveral. Launch Complex: Cape Canaveral AMR DZ. LV Family: Navaho. Launch Vehicle: Hound Dog. 1960 June 9 - . Launch Site: Cape Canaveral. Launch Complex: Cape Canaveral AMR DZ. LV Family: Navaho. Launch Vehicle: Hound Dog. 1960 June 23 - . Launch Site: Cape Canaveral. Launch Complex: Cape Canaveral AMR DZ. LV Family: Navaho. Launch Vehicle: Hound Dog. 1960 August 1 - . Launch Site: Cape Canaveral. Launch Complex: Cape Canaveral AMR DZ. LV Family: Navaho. Launch Vehicle: Hound Dog. 1960 August 11 - . Launch Site: Cape Canaveral. Launch Complex: Cape Canaveral AMR DZ. LV Family: Navaho. Launch Vehicle: Hound Dog. 1960 October 18 - . Launch Site: Cape Canaveral. Launch Complex: Cape Canaveral AMR DZ. LV Family: Navaho. Launch Vehicle: Hound Dog. 1960 October 25 - . Launch Site: Cape Canaveral. Launch Complex: Cape Canaveral AMR DZ. LV Family: Navaho. Launch Vehicle: Hound Dog. 1960 November 2 - . Launch Site: Cape Canaveral. Launch Complex: Cape Canaveral AMR DZ. LV Family: Navaho. Launch Vehicle: Hound Dog. 1960 November 15 - . Launch Site: Cape Canaveral. Launch Complex: Cape Canaveral AMR DZ. LV Family: Navaho. Launch Vehicle: Hound Dog. 1960 December 21 - . Launch Site: Cape Canaveral. Launch Complex: Cape Canaveral AMR DZ. LV Family: Navaho. Launch Vehicle: Hound Dog. 1961 January 2 - . Launch Vehicle: Navaho. Navaho program closed out. - . Nation: USA. Program: Navaho. One G-26 missile delivered to Cape Canaveral but not launched was retained there for the open-air missile park. X-10 s/n 1 was displayed in the Air Force Museum in Dayton. Harrison Storms attempted to sell the USAF on using the completed work for space launches. One proposal was to use the boosters as the first stage of a satellite launcher with Able upper stages. Another was to cluster four of them together and launch an X-15 manned rocketplane into orbit. Nothing came of these proposals. Four completed G-26 missiles and the under-construction G-38 missiles were scrapped. 1961 February 9 - . Launch Site: Cape Canaveral. Launch Complex: Cape Canaveral AMR DZ. LV Family: Navaho. Launch Vehicle: Hound Dog. 1961 February 10 - . Launch Site: Cape Canaveral. Launch Complex: Cape Canaveral AMR DZ. LV Family: Navaho. Launch Vehicle: Hound Dog. 1961 February 28 - . Launch Site: Cape Canaveral. Launch Complex: Cape Canaveral AMR DZ. LV Family: Navaho. Launch Vehicle: Hound Dog. 1961 March 10 - . Launch Site: Cape Canaveral. Launch Complex: Cape Canaveral AMR DZ. LV Family: Navaho. Launch Vehicle: Hound Dog. 1961 March 24 - . Launch Site: Cape Canaveral. Launch Complex: Cape Canaveral AMR DZ. LV Family: Navaho. Launch Vehicle: Hound Dog. 1961 April 5 - . Launch Site: Cape Canaveral. Launch Complex: Cape Canaveral AMR DZ. LV Family: Navaho. Launch Vehicle: Hound Dog. 1961 April 12 - . Launch Site: Cape Canaveral. Launch Complex: Cape Canaveral AMR DZ. LV Family: Navaho. Launch Vehicle: Hound Dog. 1961 April 25 - . Launch Site: Cape Canaveral. Launch Complex: Cape Canaveral AMR DZ. LV Family: Navaho. Launch Vehicle: Hound Dog. 1961 April 27 - . Launch Site: Cape Canaveral. Launch Complex: Cape Canaveral AMR DZ. LV Family: Navaho. Launch Vehicle: Hound Dog. 1961 May 19 - . Launch Site: Cape Canaveral. Launch Complex: Cape Canaveral AMR DZ. LV Family: Navaho. Launch Vehicle: Hound Dog. 1961 May 22 - . Launch Site: Cape Canaveral. Launch Complex: Cape Canaveral AMR DZ. LV Family: Navaho. Launch Vehicle: Hound Dog. 1961 July 7 - . Launch Site: Cape Canaveral. Launch Complex: Cape Canaveral AMR DZ. LV Family: Navaho. Launch Vehicle: Hound Dog. FAILURE: Failure. 1961 September 1 - . Launch Site: Cape Canaveral. Launch Complex: Cape Canaveral AMR DZ. LV Family: Navaho. Launch Vehicle: Hound Dog. 1961 September 15 - . Launch Site: Cape Canaveral. Launch Complex: Cape Canaveral AMR DZ. LV Family: Navaho. Launch Vehicle: Hound Dog. 1961 October 3 - . Launch Site: Cape Canaveral. Launch Complex: Cape Canaveral AMR DZ. LV Family: Navaho. Launch Vehicle: Hound Dog. 1961 October 11 - . Launch Site: Cape Canaveral. Launch Complex: Cape Canaveral AMR DZ. LV Family: Navaho. Launch Vehicle: Hound Dog. 1961 November 1 - . Launch Site: Cape Canaveral. Launch Complex: Cape Canaveral AMR DZ. LV Family: Navaho. Launch Vehicle: Hound Dog. 1961 December 21 - . Launch Site: Cape Canaveral. Launch Complex: Cape Canaveral AMR DZ. LV Family: Navaho. Launch Vehicle: Hound Dog. 1962 January 9 - . Launch Site: Cape Canaveral. Launch Complex: Cape Canaveral AMR DZ. LV Family: Navaho. Launch Vehicle: Hound Dog. Operational test - . Nation: USA. Agency: USAF SAC. Apogee: 20 km (12 mi). 1962 January 23 - . Launch Site: Cape Canaveral. Launch Complex: Cape Canaveral AMR DZ. LV Family: Navaho. Launch Vehicle: Hound Dog. Operational test - . Nation: USA. Agency: USAF. Apogee: 20 km (12 mi). 1962 January 29 - . Launch Site: Cape Canaveral. Launch Complex: Cape Canaveral AMR DZ. LV Family: Navaho. Launch Vehicle: Hound Dog. 1962 January 30 - . Launch Site: Cape Canaveral. Launch Complex: Cape Canaveral AMR DZ. LV Family: Navaho. Launch Vehicle: Hound Dog. 1962 February 6 - . Launch Site: Cape Canaveral. Launch Complex: Cape Canaveral AMR DZ. LV Family: Navaho. Launch Vehicle: Hound Dog. 1962 February 12 - . Launch Site: Cape Canaveral. Launch Complex: Cape Canaveral AMR DZ. LV Family: Navaho. Launch Vehicle: Hound Dog. FAILURE: Failure. Test mission - . Nation: USA. Agency: USAF SAC. Apogee: 20 km (12 mi). 1962 May 14 - . Launch Site: Cape Canaveral. Launch Complex: Cape Canaveral AMR DZ. LV Family: Navaho. Launch Vehicle: Hound Dog. FAILURE: Failure. 1962 May 15 - . Launch Site: Cape Canaveral. Launch Complex: Cape Canaveral AMR DZ. LV Family: Navaho. Launch Vehicle: Hound Dog. 1962 May 21 - . Launch Site: Cape Canaveral. Launch Complex: Cape Canaveral AMR DZ. LV Family: Navaho. Launch Vehicle: Hound Dog. 1962 June 18 - . Launch Site: Cape Canaveral. Launch Complex: Cape Canaveral AMR DZ. LV Family: Navaho. Launch Vehicle: Hound Dog. 1962 June 26 - . Launch Site: Cape Canaveral. Launch Complex: Cape Canaveral AMR DZ. LV Family: Navaho. Launch Vehicle: Hound Dog. 1962 August 14 - . Launch Site: Cape Canaveral. Launch Complex: Cape Canaveral AMR DZ. LV Family: Navaho. Launch Vehicle: Hound Dog. 1962 October 17 - . Launch Site: Cape Canaveral. Launch Complex: Cape Canaveral AMR DZ. LV Family: Navaho. Launch Vehicle: Hound Dog. 1962 December 17 - . Launch Site: Cape Canaveral. Launch Complex: Cape Canaveral AMR DZ. LV Family: Navaho. Launch Vehicle: Hound Dog. 1963 January 15 - . Launch Site: Cape Canaveral. Launch Complex: Cape Canaveral AMR DZ. LV Family: Navaho. Launch Vehicle: Hound Dog. 1963 February 5 - . Launch Site: Cape Canaveral. Launch Complex: Cape Canaveral AMR DZ. LV Family: Navaho. Launch Vehicle: Hound Dog. 1963 February 18 - . Launch Site: Cape Canaveral. Launch Complex: Cape Canaveral AMR DZ. LV Family: Navaho. Launch Vehicle: Hound Dog. 1963 June 3 - . Launch Site: Cape Canaveral. Launch Complex: Cape Canaveral AMR DZ. LV Family: Navaho. Launch Vehicle: Hound Dog. 1963 June 11 - . Launch Site: Cape Canaveral. Launch Complex: Cape Canaveral AMR DZ. LV Family: Navaho. Launch Vehicle: Hound Dog. 1963 October 11 - . Launch Site: Cape Canaveral. Launch Complex: Cape Canaveral AMR DZ. LV Family: Navaho. Launch Vehicle: Hound Dog. Operational test - . Nation: USA. Apogee: 20 km (12 mi). 1964 July 8 - . Launch Site: Cape Canaveral. Launch Complex: Cape Canaveral AMR DZ. LV Family: Navaho. Launch Vehicle: Hound Dog. 1964 July 29 - . Launch Site: Cape Canaveral. Launch Complex: Cape Canaveral AMR DZ. LV Family: Navaho. Launch Vehicle: Hound Dog. 1964 August 5 - . Launch Site: Cape Canaveral. Launch Complex: Cape Canaveral AMR DZ. LV Family: Navaho. Launch Vehicle: Hound Dog. 1964 August 12 - . Launch Site: Cape Canaveral. Launch Complex: Cape Canaveral AMR DZ. LV Family: Navaho. Launch Vehicle: Hound Dog. 1964 September 2 - . Launch Site: Cape Canaveral. Launch Complex: Cape Canaveral AMR DZ. LV Family: Navaho. Launch Vehicle: Hound Dog. 1964 September 11 - . Launch Site: Cape Canaveral. Launch Complex: Cape Canaveral AMR DZ. LV Family: Navaho. Launch Vehicle: Hound Dog. 1964 September 23 - . Launch Site: Cape Canaveral. Launch Complex: Cape Canaveral AMR DZ. LV Family: Navaho. Launch Vehicle: Hound Dog. 1965 August 26 - . Launch Site: Cape Canaveral. Launch Complex: Cape Canaveral AMR DZ. LV Family: Navaho. Launch Vehicle: Hound Dog. 1965 August 30 - . Launch Site: Cape Canaveral. Launch Complex: Cape Canaveral AMR DZ. LV Family: Navaho. Launch Vehicle: Hound Dog.